The 30th Anniversary of the ABA TECHSHOW is just around the corner, taking place at the Chicago Hilton, March 17-19 - coinciding with the St. Patrick’s Day festivities in Chicago. The 2016 conference is chaired by law practice management expert and Affinity Consulting partner Steven Best and features 18 educational tracks including 73 sessions, panels, plenaries and keynotes over multiple days. We first attended TECHSHOW 16 years ago and to this day, it remains a favorite show of ours to attend each year. This year we decided to emulate our annual LegalTech NY exercise of creating a conference agenda word cloud in order to provide visual clues of what topics are hot and which ones are not. Below is the ABA TECHSHOW 2016 agenda word cloud, visually displaying the words/themes included in the event's agenda of sessions. For everything attorney tech education-related, ABA Law Practice Division's TECHSHOW won't disappoint. Subscribe to InsideLegal for ABA TECHSHOW updates and market information and follow us on Twitter at @InsideLegal. The word cloud was pulled from the agenda located at www.TECHSHOW.com minus speakers' information and includes words mentioned 3+ times. As many of you know, Jobst and I have been adminstering and producing the annual ILTA/InsideLegal Technology Purchasing Survey (‘Survey’) for the past 9 years. This year's Survey included responses from 281 ILTA member law firms and has garnered more feedback, commentary and insights from our legal market colleagues than ever before. We've included links to the current blog posts and coverage of the Survey below, and wanted to feature two resources in particular. First, the industrious folks at Axcient volunteered their time and creativity to develop an infographic which provides a good graphical overview of the Survey's key findings - from big data strategies to purchasing influences to social media use to top technology purchases. Thanks to Daniel Kuperman and the Axcient team for making this happen! 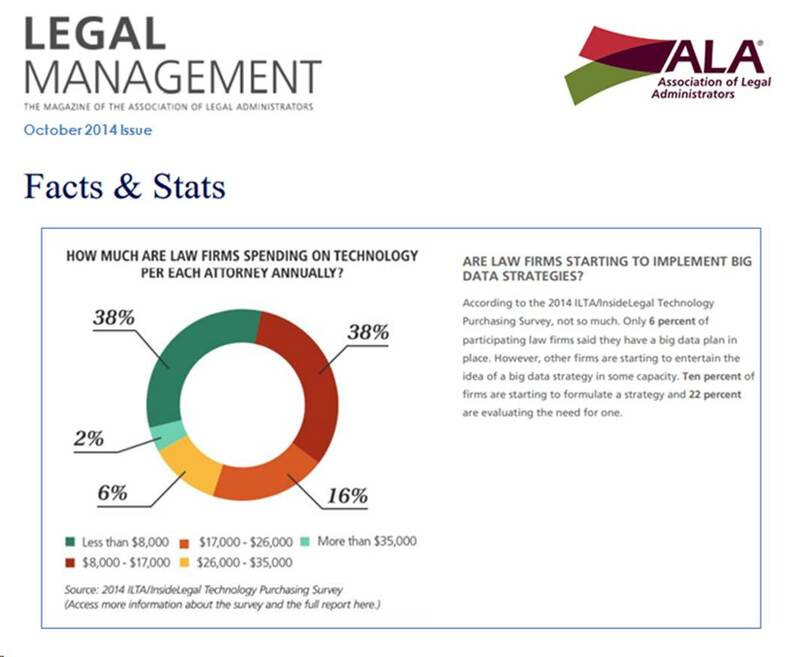 Survey: Law Firm Tech Spending Up - A joint survey from ILTA and InsideLegal says tech spending is up in large and small firms. Does ILTA 2014 Offer Indicators of a Shift to Strategic Law Firm IT? Thanks to all who have taken the time to download and review the 2014 Survey and a very special thanks to our fellow legal-ites who have gone one step further and provided keen insights and analysis.